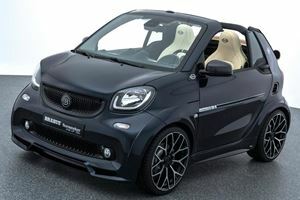 The Smart Fortwo Cabrio offers seating for two, a retractable fabric top and is powered by an 89hp 0.9-litre turbocharged engine which drives the rear wheels through either a 5-speed manual or 6-speed dual-clutch transmission. Performance is below average and the noisy cabin and hard ride make for an unpleasant highway cruiser. The Fortwo Cabrio instead relies on its tight turning circle and stylish design to set it apart from the admittedly more able opposition. Standard equipment includes crosswind assist and LED daytime running lights while top trim levels get heated leather seats and an available a Brabus package adds some sporting aggression to the Smart. The tiny Smart Fortwo can be the ideal vehicle for congested and narrow city streets, thanks to its fun-loving design cues and buzzy little engine it is not your typical bland subcompact hatchback either. For 2017 the Cabrio version has been added to the range and it offers a retractable fabric top which promises to enhance this little cars appeal. The Fortwo Cabrio is identical to its Coupe stablemate inside and this means a lot of bright plastics that try hard to disguise their budget feel. The seats are relatively comfortable for shorter journeys and the large window area and high seating position make the Fortwo Cabrio feel bigger than it really is. The fabric top retracts along two rails that run along either edge of the roof and it concertinas down behind the front headrests. This means that it does not lower the surprisingly decent amount of trunk space (for a tiny car). The cabin also has a number of clever solutions for the storage of odds and ends, the passenger seat folds flat too for bulkier items. The Smart Fortwo may have rear-wheel drive and a lightweight bodyshell but it is still no sharp handler. The suspension feels hard over bumps without rewarding the discomfort with decent cornering ability. Highway driving too is not where this car shines with too much wind noise and not enough power to undertake overtaking maneuvers with confidence. Its two main strengths are a tight turning circle and great visibility which are better taken advantage of in an urban environment. The real benefit of the Smart Cabrio is its ability to slip into parking spaces and side roads that other cars wouldn’t even consider. The Smart Fortwo Cabrio is fitted with a 0.9-liter 3-cylinder engine which makes 89 horsepower and 100 lb-ft of torque. Either a 5-speed manual or 6-speed dual-clutch transmission is available and power is sent to the rear wheels. The claimed 0-60mph time of 10.7-seconds is below par for this segment but the Fortwo feels sprightly enough at low velocities. Opting for the dual-clutch transmission sees the acceleration time drop to 11.6-seconds which is well below most other cars on the road. The combined city/highway fuel economy figure of 34mpg (manual) or 35mpg (dual-clutch) is good enough although not significantly better than the larger engined and more powerful competition. Crosswind assist, 6 airbags, central locking and a stability program with hill start assist are also standard. The Prime Trim adds leather multifunction steering wheel, fog lamps, heated seats, smart lighting package (daytime running lights, LED taillights and foglights with cornering function), leather upholstery and unique 15-inch alloy wheels. The top Proxy Trim includes these and adds a JBL audio system, blue/white interior, chrome exhaust tip, alloy pedals, shift pedals, lowered suspension and 16-inch alloy wheels. A number of these items can be individually added to lower trim levels and a Brabus Sport Package is also available which includes staggered 16/17-inch alloy wheels, performance tires, sport suspension, Brabus interior and exterior details and is only available in conjunction with the dual-clutch transmission. 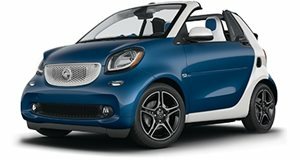 The Smart Fortwo Cabrio is a unique offering in its segment and will appeal to those looking for a stylish little subcompact that can maneuver into tight spaces with ease and offer just about enough space for your shopping too. Mediocre performance and a low-quality yet cheerful interior are among its weak points and the hard ride will be an issue for some too. Stick to the base model if you must have one but consider rivals like the slightly more expensive Fiat 500C too before committing. It’s limited to just ten examples, but you could buy a Mercedes AMG C43. for the same money.